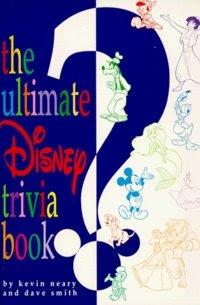 Yesterday readers were left with a few trivia questions from The Ultimate Disney Trivia Book. As promised, here are the answers along with a dash of history. From The Three Caballeros: In the opening sequence Donald Duck is celebrating his birthday. What is the date?? ANSWER: Donald's official birthday, 9 June 1934, stems from his first appearance in The Wise Little Hen. However, in 1945’s The Three Caballeros the calendar date states that Donald’s birthday is Friday the 13th. From The Happiest Millionaire: How many children do the Biddles have, and how many alligators does Anthony J. Drexel Biddle own? ANSWER: The Biddles’ three children are Cordelia, Tony, and Livingston. Anthony J. Drexel Biddle has amassed a whopping dozen, or twelve, alligators from Florida. Though it may seem like a stretch to talk about the alligators’ personalities, they have them, and Anthony is most fond of the alligator George. From Disney on Television: Who taught us how to spell “encyclopedia” on the Mickey Mouse Club?? ANSWER: Jiminy Cricket. Rather than expound upon the finer points of his lesson, here is a copy that all of us can view. From Resorts/Other Attractions: Where can you find Big Bertha?? ANSWER: Big Bertha is a stand up band organ, including instruments like pipes, drums, bells, cymbals, castanets, and a xylophone. Bertha can be found at 1900 Park Fare in the Grand Floridian Resort and Spa (which was referred to as the Grand Floridian Beach Resort back in 1993). From Euro Disney: What country came in second in the bidding war for Euro Disney? ANSWER: Spain. When the time came to select a site for Euro Disney, Disney had four options. Two along the Mediterranean Sea in Spain, another along the Mediterranean Sea in France, and the site that eventually became known as Euro Disney in Marne-la-Vallee, France. oh man I LOVE THESE!!! I've gotta get this book.